Project Management: a dedicated project manager, from start to finish. Discovery: a thorough examination of current production process and facility layouts, as well as current and future needs. Engineering/System Design: a custom system design based on discovery. Installation / Installation Supervision: highly-trained, professional staff will install your system or provide guidance should you choose to do your own installation. Preventative Maintenance Service: a plan to help you keep your system in excellent condition for ma ximum productivity. 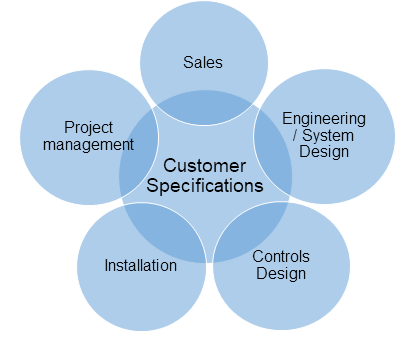 Everything revolves around your specifications. No two IntelliTrak systems are exactly the same because no two customer’s requirements are the same. Figuring out how to best solve a customer’s problem or improve their process is perhaps the most important part of the process. The more time spent here, the better the end result. With our experienced sales and engineering staff, this process is made easier. Have a layout you’d like us to review? Contact us and we’ll take a look. It just might be the best decision you’ll make all year.